I will be running stories from different sources about the crisis for Christianity in the Middle East, and frankly it is a crisis for Christianity in North America and Western Europe. As Mr. Marlin makes clear, Christians in freedom should be constantly broadcasting what is happening there, and pushing governments to DO SOMETHING REAL. Our own “intervention” and now that of Russia is doing nothing to save the descendants of the Apostles. 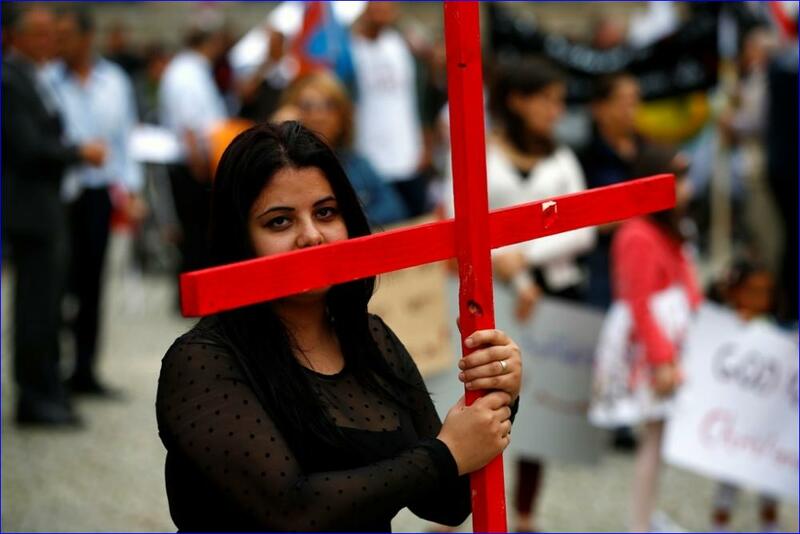 A woman holds a cross during a rally organized by Iraqi Christians in Germany denouncing persecution by the Islamic State terror group against Christians living in Iraq, in Berlin, Aug. 17, 2014. Governments and media organizations in the Western world must stop ignoring the mass slaughter of believers in the Middle East, says George J. Marlin, chairman of Aid to the Church in Need, an organization that provides aid to persecuted Christians.During an interview with The Christian Post Marlin revealed what he believes to be the only solution to defeating radical Islamic groups such as the Islamic State, whose militants are ravaging the Middle East. He also told CP that the Western world has been too quiet concerning the hell believers are living in inside Muslim controlled nations, such as Syria and Iraq, and that American Christians need to defend the rights of their brothers and sisters around the world. The following is an edited transcript of the The Christian Post’s Part 2 interview with Marlin, in which he discusses the actions Western Christians should take in order to help the persecuted Church in the Middle East. You can read Part 1 of CP’s interview here. CP: What can Christians in the West do to help the persecuted Church in the Middle East? Marlin: Christians have to wake up and start beating the pots and pans to get the West’s head out of the sand. There hasn’t been enough noise and outrage. [We also] need to provide humanitarian needs that people have. Not just food, but with refugees, facilities where their kids could get educated, get a job and rebuild their lives. We need a united voice of crying out. The pope and others have made statements, but this has to be constant. This is what Christians ought to be doing. They’re supposed to be [pushing] their congressmen and senators in the U.S. to go out and identify and start reporting this persecution. We should pressure our congressional representatives — when it comes to foreign aid — that if this kind of persecution is going on, let’s review and maybe stop foreign aid in these countries. We also need to let Christians in the Middle East know we have not forgotten them. CP: Why do you think people from the West join radical groups like IS? Marlin: I’m not sure. It could be that they think it’s a great cause. They think it’s a cause that’s worthy, which is warped thinking on their part. It also says to me that there’s a subset of people in the U.S., living in this materialistic society, who are looking for something. It says something about two generations of people in this country that are starved for some sort of fulfillment and they look to something that is radical, and they think its romantic and gives them a privilege and purpose of being. It’s sad, but I think it’s a reflection of how bad our secular society is becoming. CP: Do you think these Muslim countries will ever treat Christians as equals? Marlin: That’s the ideal. It sort of worked in Lebanon for decades. That is now changing. The only way you can have a somewhat democratic society where all people have guaranteed basic rights is by realizing [rights come from God, not government]. It’s sad to say in the Western world, particularly Europe, they do not believe that rights come from the hand of God [anymore]. That is the warped mentality we endure today. In the Muslim world, until the mainstream Muslims stand up to these radicals, it will get worse and worse. That’s the only way we can get to some sort of semblance where Christians may not be treated as equals, but be recognized as people of the Book. And as Muhammed said, in his judgement, “Jews and Christians heard from God, but they were incomplete. Muslims are complete.” The radical Islamic groups reject that thought. CP: Why are Christians in the West unfamiliar with the history of Christianity in the Middle East? Marlin: It’s part of the failure of the education system in the U.S. In Western Europe they try to deny all connection to Christianity. When they were trying to put together the European Union Constitution, they refused to recognize and admit that Christianity is the basis of the culture of Europe. We have several generations now that know very little about the history of their nation, let alone the history of Christianity. To me, this is part of the plan. If you remember, the Italian Marxist Antonio Gramsci told Joseph Stalin to forget [trying to use economic tactics to take over countries,] if you want to destroy nations and get power, destroy the culture and history. We now have generations of kids who live in this politically correct, multicultural world where they’re taught that all cultures are equal, which is of course absurd. Nazi and Stalin cultures are evil. They are not all equal. These kids are not learning anything about their nation’s cultural roots and Christianity. So you have this great void. If the media, secular press and nations don’t want to focus [on these issues in the Middle East,] it just doesn’t exist anymore. Secondly, in Catholic education the emphasis is always on Christianity in the West. Although we learned basic Church history [during my time in the Catholic system, which was during its peak era,] there was not enough time spent on it. And nowadays, there is zero time spent on it because of the political correctness and multiculturalism of the educational system, which to me has become not educational systems, but propaganda institutes to promote the ideological vision of certain groups.